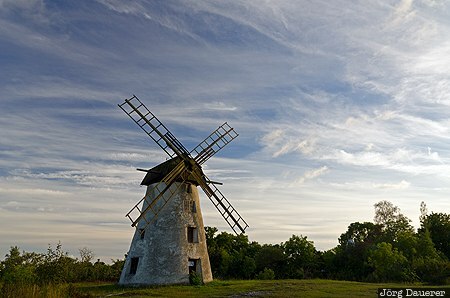 A lone windmill near Fårösund in front of a blue sky with some clouds illuminated by warm evening light. Fårösund is in the north of the island Gotland in the Baltic Sea in the south of Sweden. This photo was taken in the evening of a sunny day in August of 2014. This photo was taken with a digital camera.